The broad objective of AIACC project 47 was to develop the capacity to estimate and compare the benefits and costs of projects in natural resource sectors that reduce the expected damages from climate change in Southern and West Africa. There are two parts to this project. The first consists of using well-established principles from economic benefit-cost analysis to develop a framework to estimate the economic benefits and costs associated with the expected climate change damages avoided by a development project that does not take climate change into account. Then, these benefits and costs can be compared to the case where planners incorporate expected climate change into the project assessment. The second part consists of demonstrating this methodology in two project case studies, one in The Gambia and the other in South Africa. The South African case study examines the benefits and costs of avoiding climate change damages through structural and institutional options for increasing water supply in the Berg River Basin in the Western Cape Province. The Gambian study, on the other hand, focuses on the agricultural sector, particularly on millet, the predominant crop in the country. To facilitate analysis, the Gambian study uses a detailed water–crop model, defines and explores adaptation strategies with the model and uses the results to carry out an economic analysis. The South African project develops and applies a Berg River Dynamic Spatial Equilibrium Model as a water planning and policy evaluation tool to compare benefits and costs and economic impacts of alternatives for coping with long-term water shortages due to climatic change. Results from the study will contribute to the development of international climate change policies and programs, particularly in regard to adaptation activities in developing countries under the United NationsFramework Convention on Climate Change (UNFCCC). AIACC (2006). 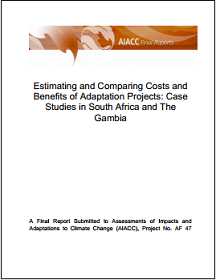 Estimating and Comparing Costs and Benefits of Adaptation Projects: Case Studies in South Africa and The Gambia A Final Report Submitted to Assessments of Impacts and Adaptations to Climate Change (AIACC).